How to make the salt dough? How to use salt dough calculator? 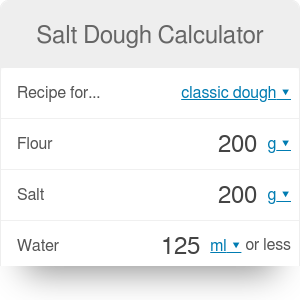 If you are looking for the best salt dough recipe, this salt dough calculator is for you. Whether you seek for the perfect proportion for air-dried models, DIY jewelry or salt dough ornaments for Christmas, you can take a deep breath and relax - you finally found it. Give the calculator a try or keep scrolling to find an explanation on how to make the salt dough. Salt dough is a modeling material made from a mixture of flour, salt, and water. It's known from ancient times when dough figures were made for offerings to the gods. When the tradition of decorating Christmas trees appeared, salt dough ornaments become popular again. In our salt dough calculator, three other less known salt dough recipes are also implemented - recipe variations using not only three basic ingredients but also wallpaper paste or potato starch. Making salt dough is not just for children - it's an easy and fun way of spending time for everybody, which helps to bring creativity back to your life. Salt dough preparation is really easy, so the youngest and the elders shouldn't have any problems with it. So how to make the salt dough? Gradually add water to your mixture. If you want to have more elastic dough, add some fluid wallpaper paste. Knead until the dough is smooth and pliable. It may take around 10 minutes. Remember to store your salt dough in a plastic bag or airtight container when not in use, as it dries quite fast. Then, you're ready for the best part - creation! Unleash your imagination and make incredible ornaments, bizarre sculptures or extravagant jewelry. The models can't be too thick or massive, as they can crumble or crack. Afterward, there is the drying part. You can choose between air drying (it can take a couple of days or even weeks for bigger models!) or baking. It's usually recommended to bake the salt dough in the low temperatures (120-250°F/50-120°C) for 2-3 hours, and then alternatively brown in 400°F/200°C for a short time. However, the time and temperature depend on the dough type, your model size, oven type and even the baking tray color. Choose the recipe type. Select the recipe you like, e.g., let's start with the classic dough. The salt dough calculator provides short information about each recipe application. If it's the one you need, stay with it, if not, read about other options. Let's assume we are happy with the choice as we are making the salt dough for the first time. Enter the amount of one ingredient. For example, 3 cups of flour. That amount seems reasonable for salt dough ornaments for our Christmas tree. If you need, you can change the units between grams and cups for the loose ingredients, as we implemented the products' densities in the tool. Grams to cups calculator may be helpful as well. The salt dough calculator found the amount of other ingredients, as well as brief instructions. We need to add 1.5 cups of salt and 9 fl oz of water. Awesome! The recipes implemented in the calculator come from an excellent book of Isolde Kiskalt "Dough Crafts". Salt Dough Calculator can be embedded on your website to enrich the content you wrote and make it easier for your visitors to understand your message.